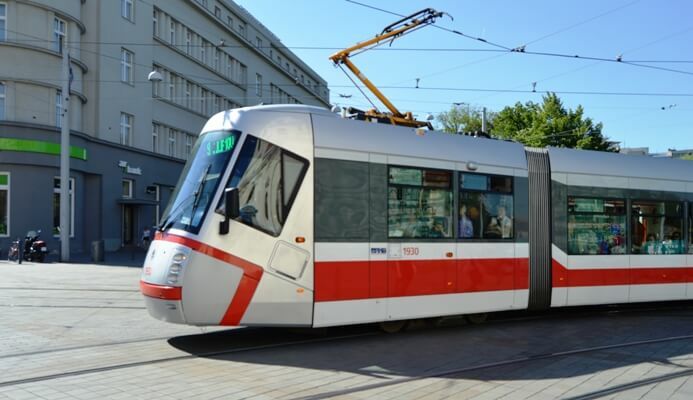 Brno tramway network was the first network of its kind to operate in the Czech lands. The first horse tram rolled to the street in 1869. Nowadays, Brno’s tram system is after Prague’s the second largest in the country. Brno tram network comprises 11 lines, with a total operational track length of 139 km and a total route length of 70.4 km. By night, Brno is ruled by buses. Each hour (or every 30 minutes) all night buses meet at Central Station (“Hlavní nádraží”) to bring the late night passengers to their homes. In local slang, the word for tram is “šalina”. 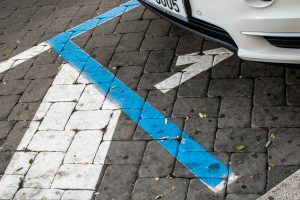 The origins of this word can be traced to the abbreviation of German expression “Elektrische Linie” (“electric lines”). The operator of municipal transport in Brno is DPMB (“Dopravní podnik města Brna”). Its lines and ticket system are coordinated with whole Integrated Transport System of Southern Moravia (IDS-JMK = “Integrovaný dopravní systém Jihomoravského kraje”). DPMB provides trams, trolleybuses, bus lines and even the ferries on Brno lake. Tickets can be bought in vending machines, located near stops, at the tobacconist’s, or DPMB centers (the headquarters is located at Novobranská 18 and is opened every day). If you are in a hurry, you can buy the ticket directly from a driver; those tickets are more expensive and you risk getting refused for the lack of change. Brno introduced the system of SMS tickets a few years ago. Those can be bought by sending a text “BRNO20” (20-minute ticket) or “BRNO” (75-minute ticket) to 90206. Brno city is divided into traffic zones 100 and 101. Unless you want to leave these two inner city zones and take a regional bus or train, you can manage with basic tickets. All of the tickets listed below allow you to transfer freely to other trams or buses. Every first Saturday of a month, you can ride “retrotrams”. The city refurbished legendary Tatra trams T3 produced between 1960 and 1999 that were sold worldwide, mostly in Central and Eastern Europe and the Soviet Union. You can get on them on the line # 10. Unique beer tram started operating this April for the third season and offers rides to the general public. The beer tram travels the city every Friday until the end of October. Beer tram passengers can take a ride to watch the fireworks competition “Starobrno Ignis Brunensis” on Brno lake. Expectant mothers can encounter a problem to find a place to sit in public transport vehicles. Brno City Transport Company inspired by the London Underground prepared special badges for them with a writing: “Baby on Board!” A badge gives the other passengers a signal that they like to sit. Badges can be picked up free of charge at the information office in Novobranská or Joštova street. List of active diversions and line changes here. Tariffs valid for 2017 here.